Crabtree & Evelyn La Source 60 Second Fix for Hands ($15): Restore dry, parched hands to silky smoothness in just two easy steps. First apply Hand Recovery, our revolutionary hand treatment that cleanses, exfoliates, and moisturizes. 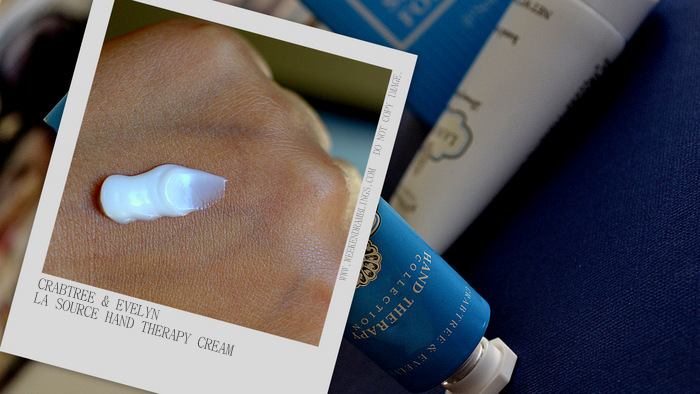 Follow with our intensive Hand Therapy for beautifully soft hands all day. Available in perfect travel sizes, this soothes and restores softness with an intensive shea butter formula for quick and amazing results. Crabtree & Evelyn is one of my favorite skincare brands, and what makes their products easier to try out (apart from the awesome quality) is the fact that a lot of them are available in affordably-priced travel sizes and kits. The most popular of these has to be the Crabtree & Evelyn 60 Second Fix - both for hands and feet - each kit comes with a scrub and a moisturizer and available in travel as well as larger sizes. The one I am reviewing today is the Crabtree and Evelyn La Source 60 Second Fix for Hands. Included in this kit are the La Source Hand Recovery scrub and the La Source Hand Therapy cream. The Crabtree & Evelyn La Source Hand Reovery scrub combines the scrubbing power of oats and salt granules with the moisturizing power of shea butter and macadamia nut oils to provide gentle exfoliation while restoring moisture to the skin. The scrub has a light, refreshing fragrance that I just love. To use, dispense a small amount of the scrub on to dry hands (slightly wet hands if you want the scrub to be gentler), scrub for about half a minute, wash off and pat dry to reveal softer hands. The results are not drastic, but there is a definite difference in my hands before and after the scrub, and I find the best results with regular use. The product does tend to separate a bit, so give the tube a good shake before use. 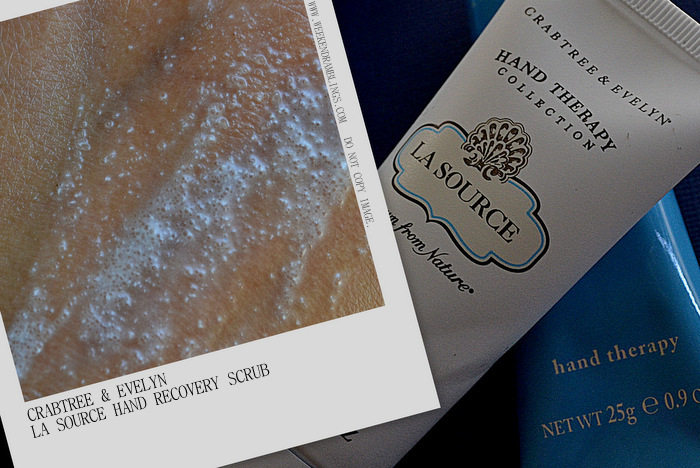 The Crabtree & Evelyn La Source Hand Therapy cream is the perfect partner for the La Source Hand Remedy scrub. With it's light, pleasant fragrance, this cream has all the moisturizing benefits of macadamia nut oil but absorbs quickly enough to be perfect for daytime use. I do feel I need a more substantial moisturizer for the night, but if you have acne-prone skin and want to avoid oilier hand creams or are just looking for something moisturizing to carry around in your bag or to the office, this would be an awesome pick. Looks very tempting :) I love the antique look of their products. I really appreciate the way you take care of your hands. We use them the most and you pamper them the most. Have to learn it from you..